The American Football League was considered to be more immediately welcoming of talented black football players than the rival NFL. 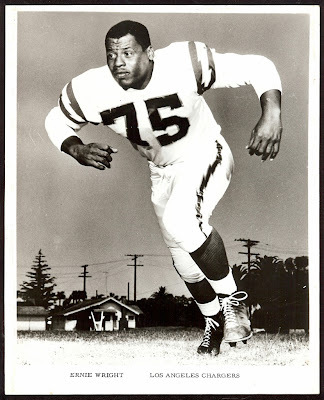 Whether that is because a true sense of justice permeated the league, or there was an immediate need for quality ballplayers is open to debate, but black football players were found on each of the eight AFL rosters when the league opened it’s doors in 1960. Still, black players were in the minority in comparison to their white counterparts. A common belief is that there were no black players on the bench. If you were black, you were a starter. The Los Angeles/San Diego Chargers were considered one of the AFL’s front runners in recruiting black players, and scouting the traditionally black colleges and universities. As a Jew, Chargers head coach, Sid Gillman, had faced his share of discrimination in his coaching career, mostly in the form of being overlooked for collegiate head coaching positions. Gillman therefore had no such policies on his team, and began drafting black players, had his players room together by position on road trips (so as to ensure black and white players lived together), and supported his black players when they faced discrimination in other cities. Still, the infusion of black football players into the professional game was slow. If you look at the Chargers 2011 media guide, 30 of the 49 returning players are black. League-wide, the NFL is about 65% black. 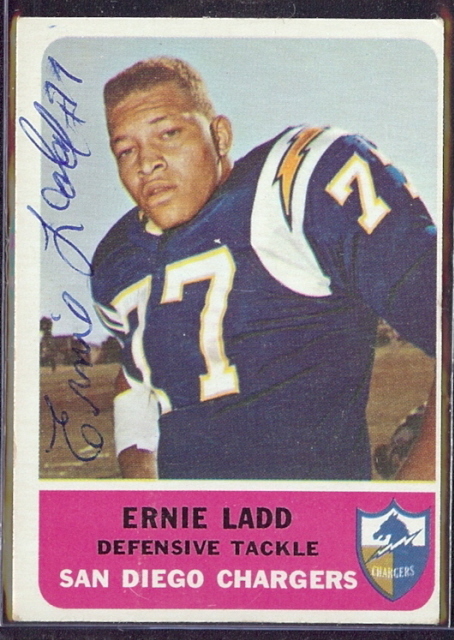 However, the 1960 Los Angeles Chargers media guide shows just six black players out of 35 on the roster. So how long did it take for the concentration of black players to grow? It would be difficult to find each player that set field for a given team over the years, so to keep a constant, we will continue to use players listed in the media guide as our sample. Using these same media guides, here is how the number of black players changed over the years for the San Diego Chargers. 1960 – 6 black players, 35 men listed 1961 – 8 black players, 33 men listed 1962 – 9 black players, 33 men listed 1963 – 9 black players, 33 men listed 1964 – 10 black players, 37 men listed 1965 – 12 black players, 39 men listed 1966 – 13 black players 40 men listed 1967 – 13 black players, 34 men listed 1968 – 12 black players, 41 men listed 1969 – 17 black players, 51 men listed 1970 – 21 black players, 47 men listed 1980 – 32 black players, 54 men listed 1990 – 25 black players, 45 men listed 2000 – 47 black players, 59 men listed At least with the Chargers, though I imagine the same can be said for all teams, the inclusion of black players was steady throughout the 1960s & 1970s, and by 1980, black players constituted the majority of the team. Sadly, many many men did not get the opportunity to showcase their talents because of the bigotry they faced. There are many stories, books and movies available that tell similar stories, not only of the ugly racism, but of how they overcame the injustice to succeed in end. I would suggest taking a look at one of these to get a more in-depth picture of these powerful stories. 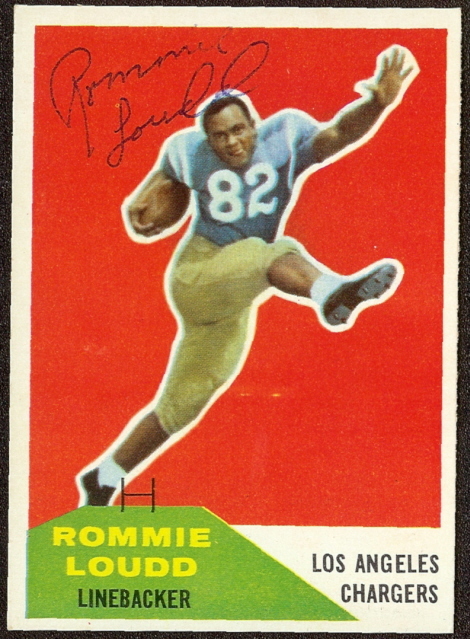 Though the American Football League is typically regarded as a league that focused on offense, there were a number of fantastic defensive players that made their names in the AFL. 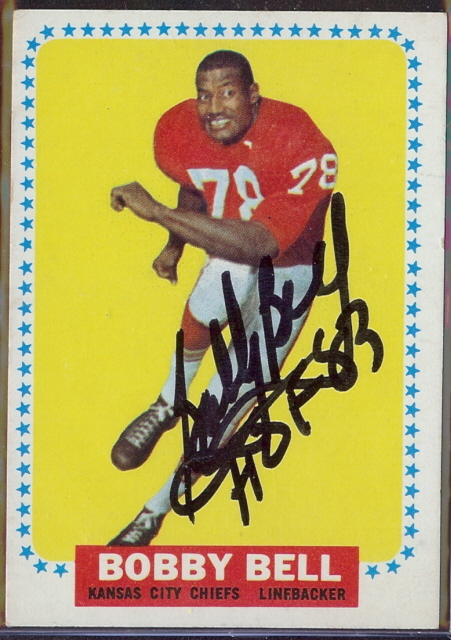 Willie Brown, Buck Buchanan, Ernie Ladd and Johnny Robinson are just a handful of legendary defenders from “The Other League.” Ranking somewhere near the top of the “Greatest of AFL Defenders” list is the Kansas City Chiefs linebacker, Bobby Bell. Bell was such a phenomenal athlete, that his head coach with the Chiefs, Hank Stram, once said, “Bobby Bell is the greatest outside linebacker who ever played the game… He is the only player I have seen who could play any position on a team and that team could still win.” High praise, without a doubt, but when you consider some of Bell’s accomplishments, you begin to understand just how good he was. He earned All-America honors as a tackle at Minnesota. .